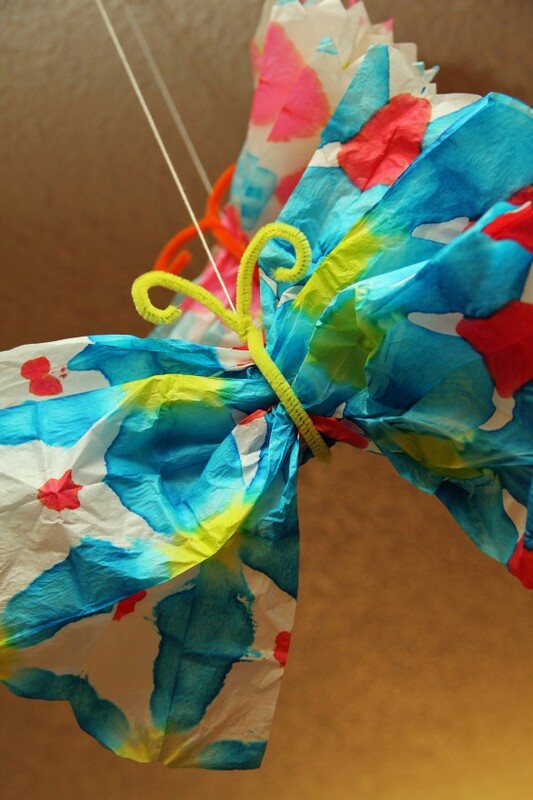 Tie-Dye Butterfly | Pi'ikea St.
Here’s an easy and colorful butterfly craft to put together with your kids. Because we’re dealing with food coloring, this is also is a great time to introduce color mixing. You’ll need to cover your workspace with newspaper and maybe put on some clothes you don’t mind getting stained. 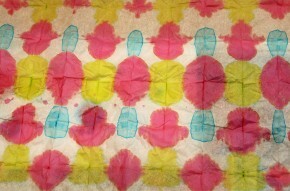 Cut tissue paper into 13” x 20” rectangles. The tissue brand used here came in 20” x 2.16’ sheets, so I just measure a little over a foot lengthwise and cut the entire length of sheet. Accordion fold your rectangle, making each fold about 1 ½” wide. 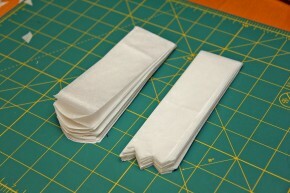 Then fold it in half lengthwise, line up the edges and round your edge with a scissors. Or for a more interesting edge, zigzag cut it. Now it’s time to dye our paper. Drop equal amounts of food coloring and water into each dish. 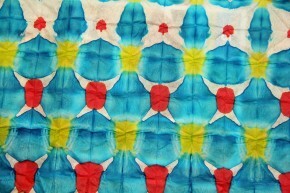 Place a corner of a triangle into the dye and remove it once the dye rises up to the rubber band. Repeat with the other two corners using different colors. Allow to dry. 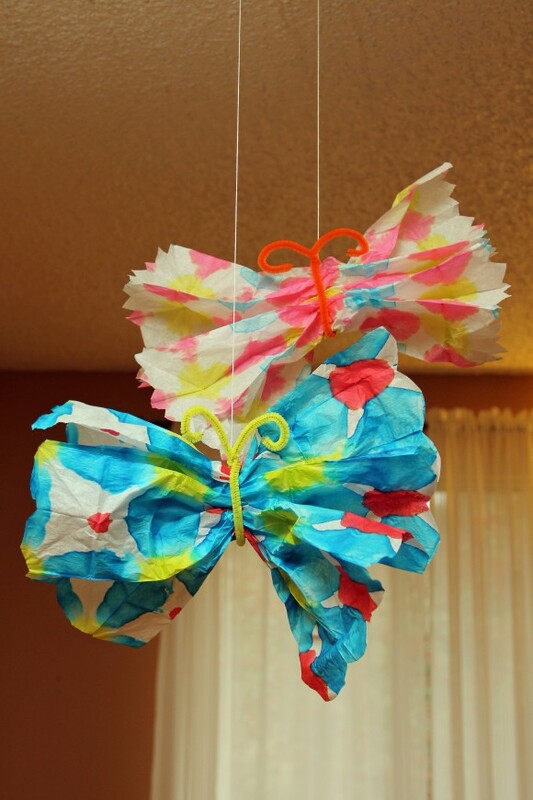 Gently remove the rubber bands and unravel the tissue paper. If the middle is still moist, let it dry. Time to put together the butterfly. Fold a pipe cleaner in half. Take a tissue paper; hold the shorter sides of the rectangle with each hand in the middle. Gather the paper until you reach the middle. Wrap the pipe cleaner around the portion you gathered and make a full twist. Use your finger to curl the ends of the pipe cleaner. 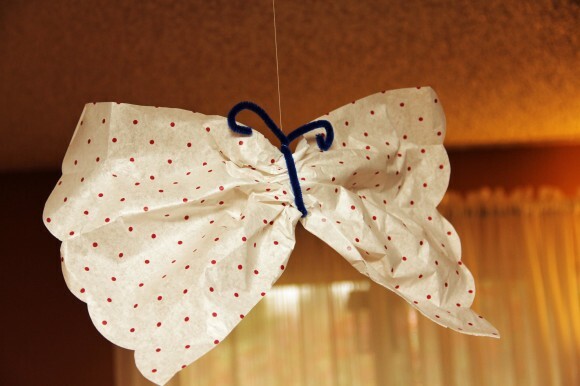 Use string to hang your butterflies. It’s always fun to use food dye for mixing colors. How many new colors did you end up making? If you don’t feel like getting messy, feel free to use printed tissue paper. They’re just as pretty! p.s. We linked up at this party!